"The Queen of the Peri Takes Her Time," by Corey Flintoff [bio] (edited by C.C. 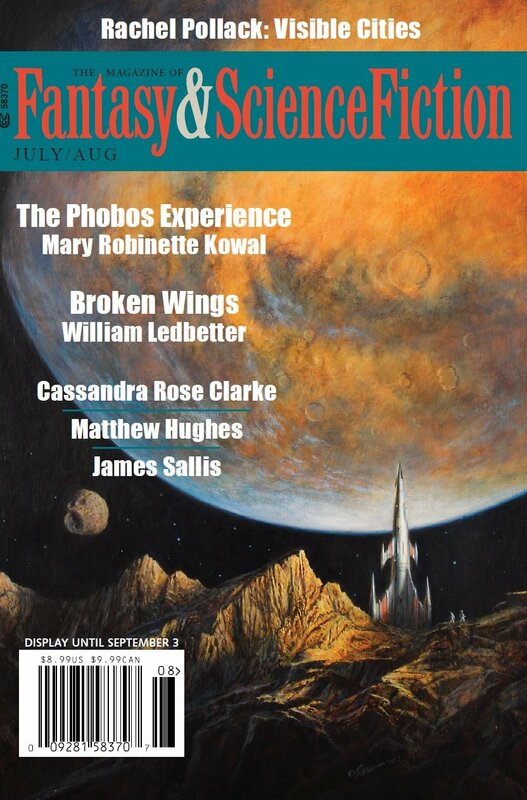 Finlay), appeared in Magazine of Fantasy & Science Fiction issue 07-08|18, published on June 26, 2018 by Spilogale Inc. Pro: The narrator beats the queen, at least for now, and he’s content with that. The secret to accomplishing this was threefold: first, racing in a car creates a place that’s neither here nor there, second, his new emotion—fear—provides her a thrill that delays her taking his heart, and third, her wings are a vulnerability at that kind of speed. The narrator has matured through this experience. He still has his fear, but he doesn’t let it control him. Another charm of the story is the bits of slipstream humor in it. E.g., when he meets Kahn, he’s not wearing the crystal hand; he’s using it for an ashtray. Or the way the djinni asks the current time when he’s summoned. Huda’s decision to go off gallivanting with the djinni is amusing too. Con: The very ending, that he takes a job with Mungummery Middle Eastern Development, it a bit of a false note. He was just a racecar driver, after all.